Today I'm participating in Steven Shrewsbury's Overkill tour. I'm really excited because I get to offer a huge giveaway package to three lucky Book Den readers! Deliverance will come... A great flood once wiped clean the earth, destroying everything upon it. 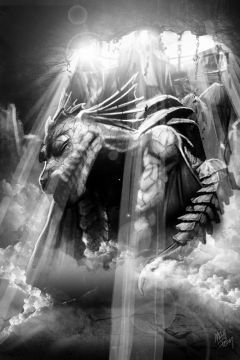 Before the deluge, in a time now forgotten, the world was a place of warriors and witches, conflicts between kingdoms, and, until their extermination, dragons. In this world, men may live centuries, fallen angels have begotten terrifying spawn, and sometimes, the best hope can be found in a brothel. 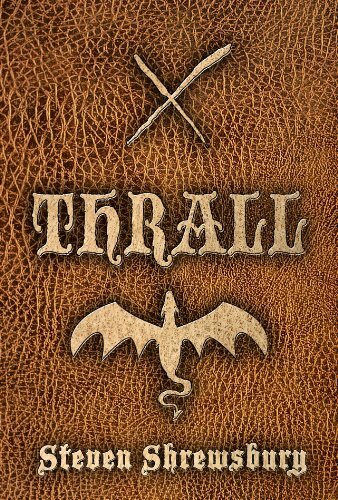 With the aid of one of the queen's elite guard, the battle maiden Alena, and the young palace servant Orsen, the old mercenary will face pirates and traitors, monsters and foul magic in the quest to find the missing heir and learn the truth behind the disconcerting murders. Deliverance will come for Gorias La Gaul, but for now there are women to love, secrets to discover, and killing that needs doing. 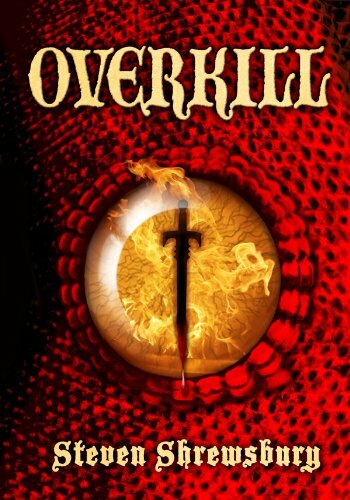 From Seventh Star Press: "Overkill is the second novel featuring the iconic sword and scorcery figure Gorias La Gaul, following the debut of the character in the novel Thrall, released in late 2010 from Seventh Star Press. Gorias La Gaul is also featured in two short stories, Author and Finisher of Our Flesh, and Insurmountable, both available in eBook format in the Blood and Steel: Legends of La Gaul collection in the Seventh Star Singles catalog." There are two prize packages available in this giveaway. First place winner gets first choice of which prize pack they would like to receive. If he/she chooses the digital prize pack, the first runner up will get his/her choice of prize pack and so on. There will be a total of three winners. The digital editions will be your choice of Kindle gift or epub. I will leave the giveaway open through Friday, May 4. There are no requirements to enter. Just fill out the form below with your contact information and prize pack preference. Update: The contest is now closed. Congratulations Mary, Angela, and Sheila!! 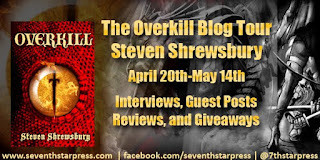 For more giveaways, guest posts, interviews, and reviews check out the full Overkill tour here. I haven't heard about this one before it sounds pretty creepy and intense. Evil angel spawns!! haha. Great post chick! Oh my gravy!!! This sounds epic! Thanks so much for this giveaway, and for introducing me to this series. Woo~ throwing my hat in the ring!